Quick Take: Top Shot, "Sweating Bullets"
Review: Top Shot, "Sweating Bullets"
(S0401) Once again we are joined by professional adventurer Colby Donaldson on a rootin', tootin', shootin' adventure. I'll be the first to admit that I love Top Shot. Why, you ask? I'm not really sure, as I don't own a single firearm nor have ever really fired one. Regardless, I've enjoyed the three previous seasons of Top Shot and was eagerly awaiting the premiere of Season Four. The familiar set-up from years past greets us once again with a few new interesting twists. For starters, the stakes have changed quite a lot this season. 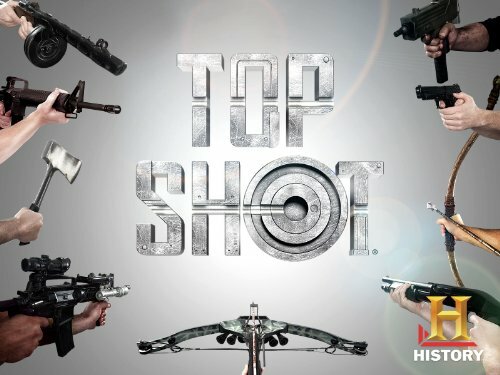 The winner will still get title of “Top Shot”, but instead of winning the money, like previous seasons, they will win a professional shooting gig sponsored by Bass Pro Shops. While the title is spiffy, there will be four “top shots” running around, all gun crazy, after this season. So, it's always been about the green, but now with a chance to become a paid pro-shooter on the line, I expect a different attitude from the participants. This applies heavily for all of the self-trained contestants, because they will have a golden opportunity to take a hobby and transform it into a career. Which is pretty exciting in my book as I'm always a sucker for a good underdog story. We start this season with 18 contestants, two more than normal. This is because in a true opening gambit fashion the season begins with an elimination challenge. So, right out of the gate I was glued to set because I barely got to know the contestants and two of them were already fighting to stay in the competition. The challenge revolved around shooting one shot from an M14 rifle at a target. The 16 closest people to the bulls-eye get to stay, easy enough. Epic music and slow motion camera work kept the action suspenseful throughout the challenge. In the end, two of our original contestants are eliminated and 16 go on to farther tasks. I always enjoy the challenges like this one because a world champion pistol shooter was taken out of the competition by a self-instructed IT specialist. This challenge also split our contestants into the red and blue teams based upon where their shot landed on target, very clever History Channel. So, there are cheers and applause as our contests leave to the Bat Cave or in this case a fabulous mansion. We get to see our winning 16 enjoying food, drink, and comradery that will no doubt be destroyed as the games progress. As with previous seasons the latter portion of the episode focuses on the team challenge. These challenges determine who has to go home, how much drama occurs back at Wayne mansion, and how many tears are shed on the shooting range. In this episode the weapon of choice is the Ruger Valquero, a six-shooter. The challenge consisted of eight rows of targets progressively getting smaller. Each team had to choose someone to attack each row and that person had to flawlessly clear all six targets. I'm continually impressed with the shows unique ideas for challenges and their ability to make a simple act of knocking down targets, very exciting. It's so cute how they always seem to have everything in a perpetual tie. It also has to be really annoying as a contestant trying to focus on one little target while Colby continually yells random things at you. After some very keen gun skills and a lot of frustration the red team claimed victory with their IT specialist locking in the win. With red teams win that means that the blue team has to put up two of their members for the elimination challenge. Gregory and Frank were selected by popular demand (mainly because they both shot like a three year old in the team challenge). So, it only seemed logical they would be in the hot seat for elimination. This one revolved around the M1 Carbine and hitting targets from the side car of a motorcycle. This WWII inspired challenge was actually pretty darn cool and I thought it was one of the more interesting ones that they have created. After two runs through the trenches Greg's ammo conservation skills allowed him to beat out Frank and stay in the game. I enjoyed the start to this season and I'm definitely looking forward to how things will progress. A lot of the same from previous seasons combined with some new twists will keep me coming back each week for sure. In my book if it's not broken you shouldn't fix it, with Top Shot that goes double.